A delicious vasilopita recipe, infused with the aromas and blends of oranges and garnished with a thick and glossy vanilla scented sugar glaze! Vasilopita is a traditional Greek cake or bread served at midnight on New Year’s Eve to celebrate the life of Saint Basil. 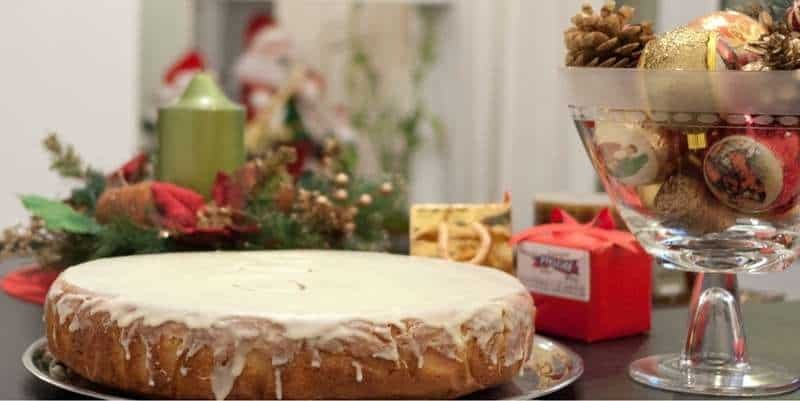 After baking the vasilopita cake, a coin is inserted through the base and when cut the person who finds the coin is said to be granted luck for the rest of the year! Vasilopita is made of a variety of doughs, depending on the region and almost every family has it’s own recipe. The most popular vasilopita recipes are either made with tsoureki dough or like a cake. This is my family’s vasilopita recipe with which we welcome the New Year with friends and loved ones for over 30 years. Hope you enjoy it! Vasilopita recipe – How to make the perfect Greek New Year’s cake! Once starting to prepare this vasilopita recipe, make sure that your butter is at room temperature before using. It is very important to mix the butter and sugar thoroughly until the butter is really fluffy and creamy, like whipped cream, and the sugar has dissolved. Give this step some extra time and the result will definitely reward you. In many vasilopita recipes, the eggs are added whole to the cake mixture but with this recipe the egg whites are beaten into meringues and combined towards the end with the rest of the dough. This is the secret to a more fluffy and airy vasilopita. To avoid the egg-y smell, which can ruin the flavour of your vasilopita, add the egg yolks one at a time, allowing each one to be absorbed from the mixture. Once done mixing the rest of the ingredients, use a marise spatula to incorporate the flour and the meringue. Using an electric mixer will result the vasilopita to loose it’s fluffiness. Just add the flour (sifted) and the meringue and blend with light circular movements, trying not to overwork the dough. Also very important is not to open the oven under no circumstances, before 30 minutes of baking, as this will result your vasilopita to deflate. Finally don’t forget to insert the coin through the base of the cake! If you prefer to make a vasilopita using a tsoureki dough, here is a no fail tsoureki recipe, for you to succeed on your first time. Oh and you can always read this delicious recipe in Greek here Συνταγή για Βασιλόπιτα κέικ. Enjoy! To prepare this vasilopita recipe, start by dividing the eggs into yolks and whites. Place the egg whites in the bowl of the electric mixer, along with a pinch of salt. Make sure your egg whites, bowl and whisk attachments are clean and free of any water. Whisk the egg whites until the mixture is very thick and glossy and a long trailing peak forms when the whisk is lifted (meringues). Place the mixture in a bowl and set aside. Use the electric mixer, to mix the butter and sugar, for about 20 minutes, until the butter is creamy and fluffy, like whipped cream. Add the egg yolks, one at a time, whilst mixing, allowing time for each one to be absorbed, before adding another. Pour in the orange juice, the vanilla extract, the orange zest, the yogurt and mix to combine. Add 1/3 of the sifted flour and blend, using a maryse spatula. Add 1/3 of the meringues and blend with light circular movements from the bottom up. Repeat with the rest of the flour and meringue (adding 1/3 of the flour and 1/3 meringue and then the remaining flour and meringue). To bake the vasilopita, preheat the oven to 200C (both top and bottom heating elements on). Butter the bottom and sides of a round non-sticking cake tin (approx.32cm diameter) and pour in the mixture. Place the cake tin in the preheated oven, on the lower rack, turn the heat down to 175C and bake for 50-60 minutes, until nicely coloured and cooked through. Check if the vasilopita is ready, by sticking in the middle of the cake a wooden skewer or toothpick. If it comes out clean, then the cake is ready. All I can say is YUM. So moist, this is my new favourite. It was a hit with my family and friends too. I followed this recipe to a tee….i was so disappointed. It did not bake inside and it was heavy. Will not make this recipe again! Is the butter salted or nonsatlted!? Made this for the first time…. It was a hit!!!!! Fantastic recipe and my kids loved it! Hi, I made this today and the middle sunk 🙁 Not sure if this is because of the weight of the ingredients I used…. Would you consider giving weight in grams for the ingredients that are listed as “cups”. In Australia, a “cup” is 250g, in the US a “cup” is 240g and in Greece I believe that a “cup” = 200g. So, are the 3 cups of sugar listed in this recipe 750g, 720g or 600g? Please. consider listing all ingredients by weight. Have to agree, I have no problems converting things like grams to ounces etc., but cups are so confusing as different countries use different sized/weighted cups! This cake is absolutely amazing! Probably the best Vasilopita I have ever tried. Thank you for this great recipe! Is the oven temp for fan forced or conventional ovens? I have a fan forced oven and in less than 10 mins it was brown on top! I changed the temp down to 150 to avoid a burn. Might be a good idea to indicate that in your recipe? I have tried this for the first time and don’t know how it will turn out. Will let you know how it goes. Happy New Year! Good question! I am making my cake today, and our oven is the same as yours. Hope it will turn out OK. A Greek friend just sent me a photo of hers, which looks wonderful- not sure I’ll be sending her one of mine! Let me know Victoria how yours turns out! I have the same oven and I have gone to 150 for about one hour. It has been a very good choice. All has ended with success. Thank you for your recipe. I have made it for our family meeting on the 1st of January. Perfect cake and very good result. Tasty and flavorful is a very good choice. I have used for the glaze orange blossom water and all have been perfect. Happy New Year from Romania! I made two vasilopites from the same recipe! 150c worked perfectly for one hour. They came out beautifully and tasted superb! Thank you for the wonderful recipe. My mum was astounded that my first try at making vasilopites (without baking soda) worked so well! Happy New Year and Happy Name Day to all who share the Saint’s name! Would I be able to make it on the 29th December for New Years Day?